When will be Stranded with a Million Dollars next episode air date? Is Stranded with a Million Dollars renewed or cancelled? Where to countdown Stranded with a Million Dollars air dates? Is Stranded with a Million Dollars worth watching? Tensions mount among the four remaining players; the group must work together as one team; a bold move is made. The rivalry heats up; Makody blocks food purchases; Alex and Gina struggle to stay; Alex makes a shocking play. Nearing the final days, team Makody declares war on Alex and Gina; Cody strives to make his enemies quit. 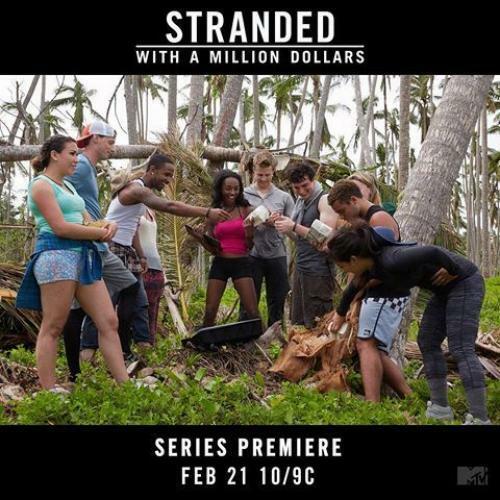 Stranded with a Million Dollars next episode air date provides TVMaze for you. EpisoDate.com is your TV show guide to Countdown Stranded with a Million Dollars Episode Air Dates and to stay in touch with Stranded with a Million Dollars next episode Air Date and your others favorite TV Shows. Add the shows you like to a "Watchlist" and let the site take it from there.